Below you can find the graph with the market share of jobs of the ten largest profession classes in Germany. Most jobs can be found in ICT, according to Jobfeed, the analysis tool for the labour market. More than 11% of all online jobs are in this profession class. More than half of all jobs are distributed over the six largest profession classes. After IT, the largest profession classes are Sales and Trading (10%) and Administration and Customer Service (9%). Almost a quarter of the online jobs posted in the first semester of 2013 are in Bavaria. Bavaria is followed by Baden-Württemberg (19%) and North Rhine-Westphalia (14%). 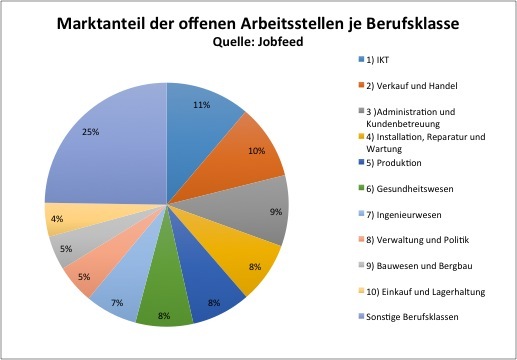 Almost 9% of all jobs in Baden-Württemberg are in Engineering. This is more than 25% above the national average. 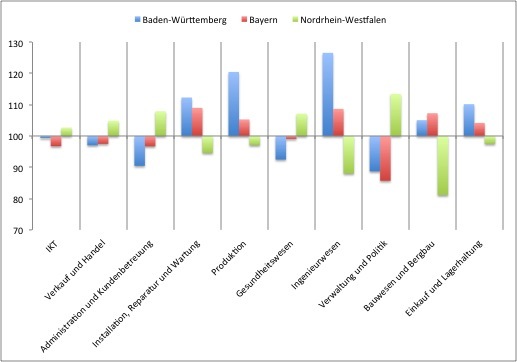 Also the other technical occupation groups like Production (+21%) and Installation (+12%) are well represented in Baden-Württemberg. North Rhine-Westphalia shows the opposite. The technical occupations score less than average (Construction -19%, Engineering -12%). However, vacancies in Management, policy and governance (+13%), Administration and customer service (+8%) and Healthcare (+7%) are well represented. Jobfeed shows a list of the top 10 most asked professions in Germany and the city of Cologne in the first half of 2013. What is striking is that there is a high demand for IT professionals in Cologne. Software Engineer and SAP Consultant are the most requested professions. Also in the list is the the Java Developer at number 7. In the overall list of Germany, this job has position number 45. Previously we mentioned that there was less demand for technical workers in North Rhine-Westphalia. This is also evident in this list. In the top 10 largest occupations in Cologne are no technical professions present. This analysis was made by monitoring 2,970,477 jobs spread over 26,028 websites in the first half of 2013. Internships, student jobs and volunteering jobs are omitted here. Jobfeed collects all job-expression online and deduplicates them against each other. In the first half year of 2013, Jobfeed found 1.71521 million unique job ads. The data comes from Jobfeed DE, the monitoring tool by Textkernel for the German job market.